Rajiv Gandhi University’s annual magazine “The Peak” was officially launched today here at the Registrar’s chamber. The 19th edition of the university’s periodic publication was formally released by RGU Registrar Tomo Riba amidst a small gathering of RGUSU and RGURSF members. Releasing the publication, Riba congratulated the students’ union and hoped that such academic tradition be followed in the future too. ‘The Peak’ is published every year by the varsity’s Students’ Union. 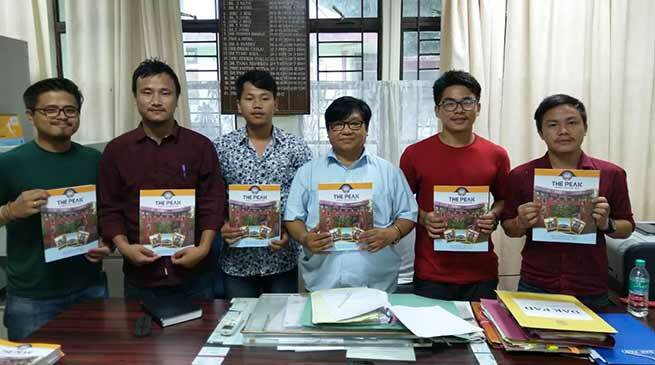 This year’s Editor, Information and Publicity Secretary of RGUSU Jang Nabom said total four sections are covered in the magazine, compromising of poems, articles, photo and hindi section. The magazine contains a glimpse of all the activities conducted by the university in one academic calendar. Besides presenting various scholastic views, it creates a platform for students to excel their skills, talents and artistic work in the field of art and literature.